7/3/08 Update: The upgrade was successful, but I had to remove the Recent Comments block from the sidebar because it was using too much of my server’s CPU resources. Comments are active again, though, so post away! Regular blog visitors might have noticed some downtime since Sunday as well as a switch to a pretty basic WordPress default theme today. Apparently one of my WordPress plugins recently went a bit bonkers, and my web host’s bots have been automatically taking the site offline because lil’ old Caustic Musings was using more than its share of the server’s CPU time. Anyway, I’ll be troubleshooting the issues and upgrading my scripts Thursday and generally bringing the various bits and pieces of the blog back up to speed as soon as I can. I am disabling comments until I get everything working properly again. Thanks for hanging around, and please excuse the temporary mess! If you live in the central Florida area, why not stop by a branch of Florida’s Blood Center and donate a pint of blood as your good deed for the July 4th holiday? 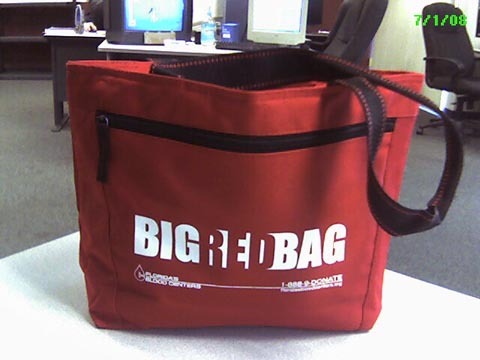 The blood center is giving away a $10 BP gas card and a spiffy insulated red lunch tote through July 6, and you will also be enrolled in their Darden Restaurant Club Red program which gives you a $10 gift card valid for Olive Garden, Red Lobster, Bahama Breeze or any other Darden Restaurant for every 2 donations. Hey, a frugal fitness geek can never have too many insulated food carriers, and $10 for gas definitely won’t be taken amiss in my house.